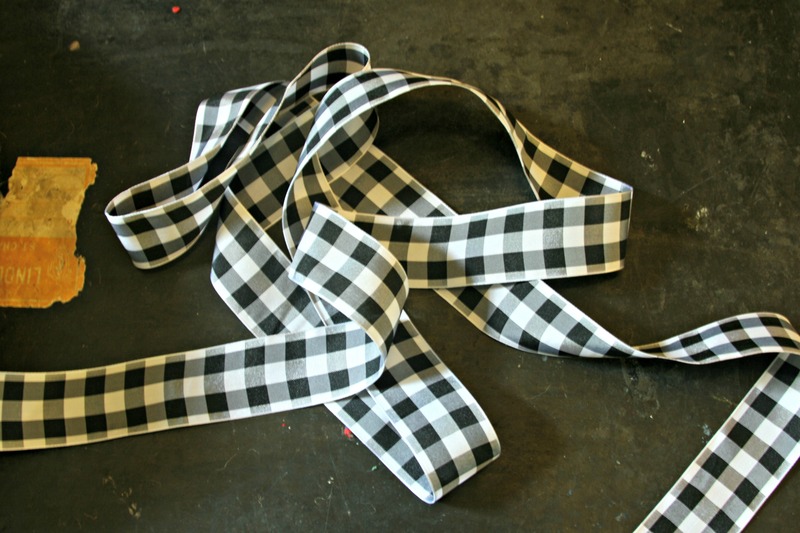 Over the last year I’ve been madly in love with Buffalo Check. 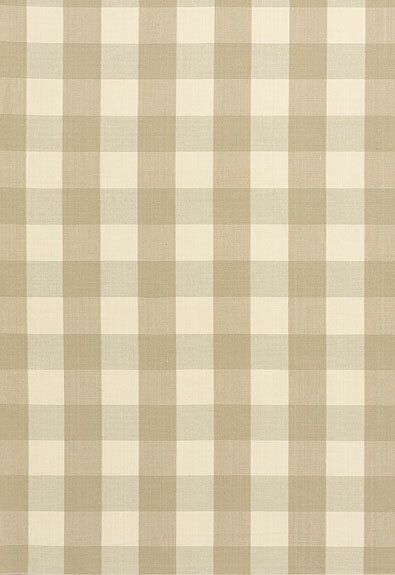 Especially black and white buffalo check, or a tan and cream check. I’ve admired this photo on my Pinterest page forever, but I cannot seem to find the original source. It appears to have come from a magazine. If you happen to know the original magazine or source, let me know! My 9 year old was actually quite helpful with the whole process. He agreed that he liked this ribbon best. I think he was agreeing with me just to get me out of JoAnns (smart boy). The wreath I have is actually one I made a year or two ago with some dear friends (I think I was pregnant with Knox??? ), but I’ve never really had enough inspiration to figure out how to embellish it, or really had a place for it. Until today! 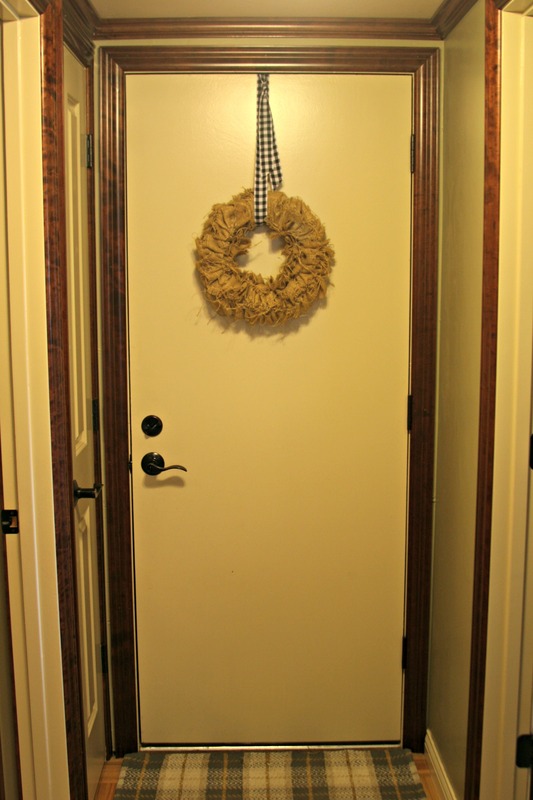 I simply wrapped the ribbon with a slip knot around the wreath and hooked over the door. 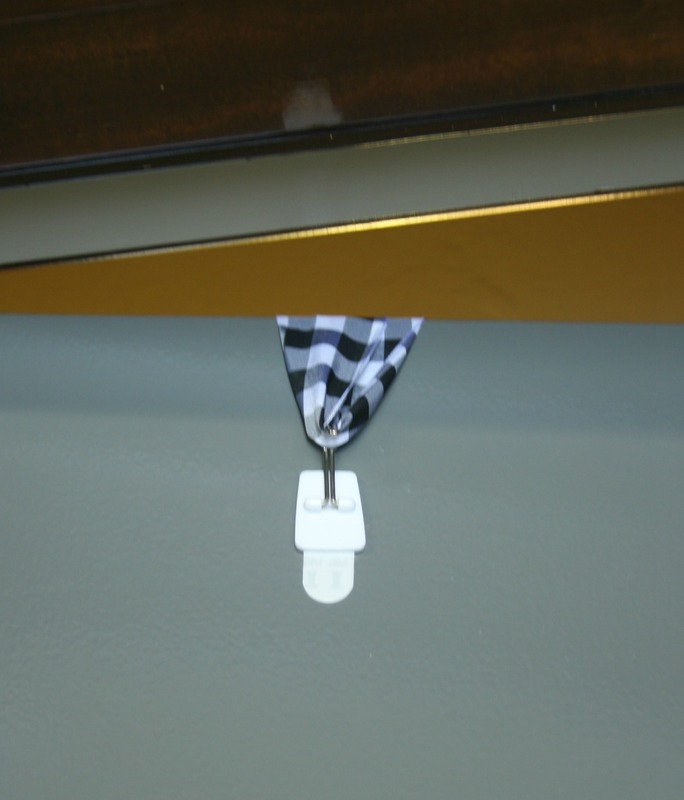 I have a handy 3M hook hung upside down on the outside of our garage door, so no big door hanger is needed. This might look strange on a front door, where you would see your hook hanging upside down in your entryway, but it’s nice for the garage door so I don’t have to commit to anything permanent. I’m happy to have this wreath out of the bag and hanging up. 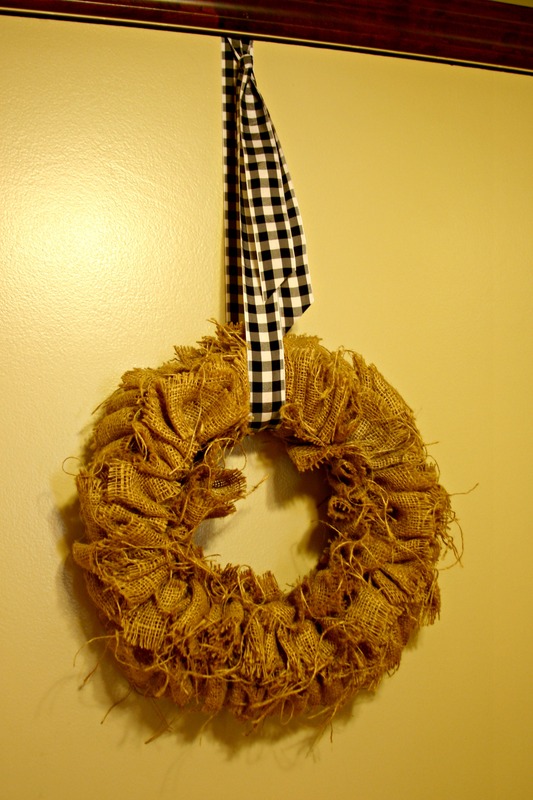 Although I feel like burlap fabric has sort of been overdone, I still like this wreath and am glad to have a chance to use it (FINALLY!) It’s a nice, homey greeting on the way to the car. What do you think? 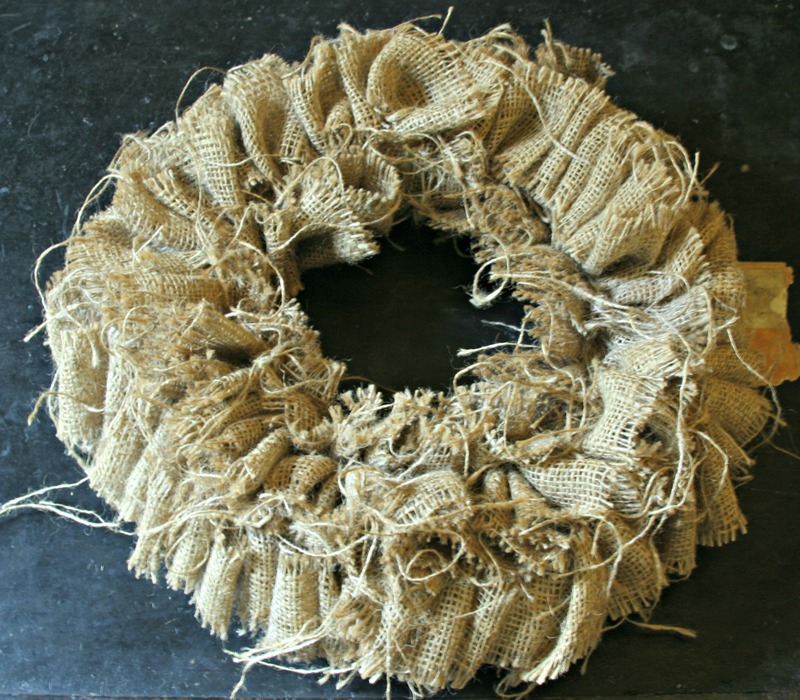 Are you still into burlap, or is it so 2012? Any ideas on how to embellish it further, or is it good the way it is? really cute and looks easy to make! I like it! Thanks, mam! It took about 2 minutes. The making of the wreath, as I remember took an hour or two 🙂 But you could use any wreath! I think a trip to St. Louis and back would just about Knock out the Knox Knight and last I check McD’s brews coffee. How ’bout it? He’s asleep now, and I’m headed that direction too! Hopeful that he starts to get the hang of this sleeping thing! There isn’t enough coffee in the world to keep me awake these days! PS your blog is cute. You should post to it. I’d read it! Burlap in small doses still cute, excessive burlap, not cute. 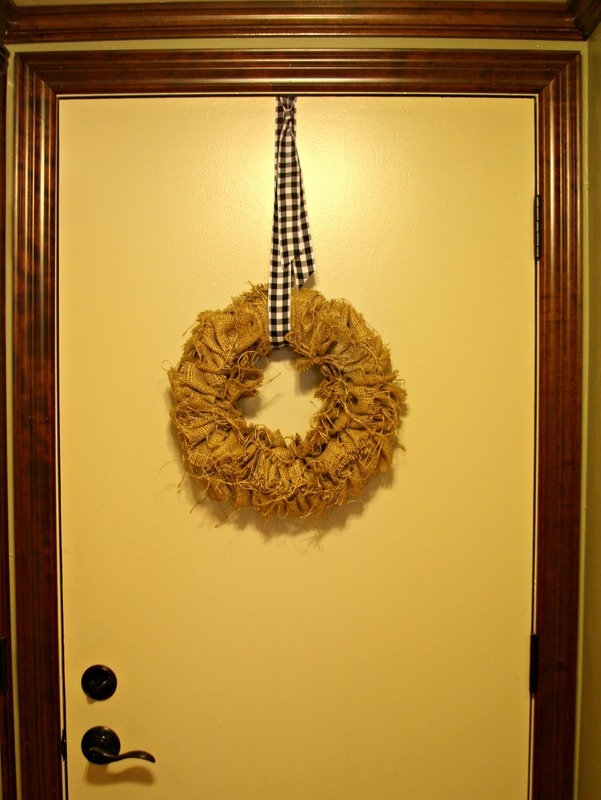 Your wreath = cute.